7 days, 6 nights. Moderate riding version of Happy Central North 7 Days Motorbiking. The video below has some portions of this happy Central North 7 days motorbiking. In case you want to watch more videos of our Vietnam motorbike tours please check our YouTube channel. Today is the first day of this happy Central North 7 days motorbiking. Before starting to ride, we will have a short briefing to let you know about the rules. In addition, the guide will show you how to understand him by his body language. We start around 9.30am after the rush hours. The valley of Mai Chau lies between two rivers: the Da River and the Ma River. Therefore, Mai Chau is very fertile and rich in varied landscapes, medium mountains, forest, lake, rivers, and infinitude of small footpaths and offer many possibilities of a trek. In the valley of Mai Chau and its surroundings are Muong, White Thai, H’mong (live in the high mountain), and the Dao who we meet at the markets or in their villages during trekking, boating or while driving. Day 2: Mai Chau – Phu Yen. ~160 km, ~5 h.
In general, today is a nice ride and involves different types of terrains and also the forgotten road. In addition, there is a 15-minute entertaining ferry transfer across Da (Black) river at Van Yen. Phu Yen is a small town, pretty quiet and offer some comfort. Day 3: Phu Yen – Than Uyen. ~200 km, ~7 h.
Ride on stunning mountain roads and take in Lung Lo pass to make our way to Than Uyen. In fact, the road is wild and bumpy. Between Sapa and Hanoi, we will find an important mountainous massif, almost as high as the Fansipan: the Mu Cang Chai. From the top, we have one of the most beautiful views of Northern Vietnam. Day 4: Than Uyen – Sapa or Bac Ha. ~120 km or ~200 km, ~4 h or ~7 h.
Ride on the Hoang Lien range direction Sapa. Arrive in Sapa in the afternoon. Here we have two choices: In case you feel tired, we stay in a Giay family in Ta Van village. However, if you feel like more riding, first down to Lao Cai and then up to the mountains area of Bac Ha and have a home stay in an H’mong village. Day 5: Sapa or Bac Ha – Luc Yen. ~180 km or ~120 km, ~6 h or ~4 h.
In fact, it’s just an easy ride on easy roads. The landscapes are very varied, ride under the palm trees to arrive in Luc Yen, where Dao and Tay people live. Homestay. Day 6: Luc Yen – Vu Linh. ~70 km, ~2 h.
Ride along Thac Ba lake until our friends Dao village of Vu Linh where we spend the night in the traditional house on stilts. Superb work of wood. The houses are superb. In addition, the exceptional greeting and fiesta people in Vu Linh will be the highlight of the trip. The road is easy and relaxing. We will avoid heavy traffic by taking the road via Son Tay. 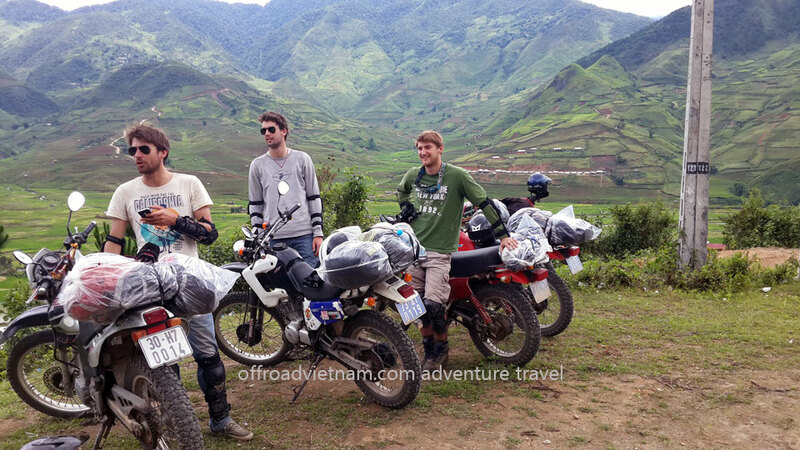 Contact us now to book this tour or to know about different itineraries and options of this happy Central North 7 days motorbiking of Vietnam.